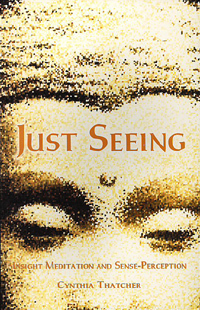 In eloquent, expressive language this book explores in depth the Buddha's significant teaching, "When seeing, just see; when hearing, just hear," as it applies to the practice of insight meditation as taught by Mahasi Sayadaw. Along the way, the book touches on the two kinds of reality - ultimate and conventional - expounded in the Abhidhamma. The author explains these two realities through the example of a pointillist painting of Seurat that can be viewed in two ways. In addition, there are meditation instructions for beginners, an appendix on the perceptual process as described in Buddhist metaphysics, and a crossword puzzle of Pali terms. . This book is essential for any student who wishes to establish a firm understanding and solid foundation for insight meditation. Cynthia Thatcher, much like Ayya Khema, has made a major contribution to the understanding of one of the important elements in Buddhist practice. Just Seeing is a book that will yield more each time you read it. After reading this book, you have a very clear idea of what Insight Meditation offers and why you would want to practice this as opposed to other meditation practices. Having been around the bend with various spiritual and meditation systems, I really needed something which made it clear why I would want to do this and what unique results I would get.